Death: What’s up with your rent? So this past week has been filled with people dying or the remembrance or interment of dead people. Not anyone I knew personally, but you all know how I get about death. It’s the sharpest wake up call for everyone, myself inclusive. First off, Stephen Keshi passed on the 8th of June, he wasn’t up to 60. Keshi holds quite a few awards and records (which I’m sure you all already know so I won’t go into them). He is however the only Nigerian coach to have won the Africa Cup of Nations, and the second person in history to win the competition as a player and as a coach after Mahmoud El-Gohary of Egypt when he led the Super Eagles to win the tournament in 2013 in Johannesburg, South Africa. Whoop! His wife of 35 years passed on sometime last year (she had cancer), and news reports say he never really recovered from her death. News reports also say he had a heart attack. A few things. Even people who gave him great grief as coach for Nigeria’s football team were singing his praises after he passed. The 8th of June is the anniversary of former military dictator Sani Abacha. He died in 1998. I think everything I think about that is summarised in this tweet I pushed out same day. Then, last night I watched the memorial service for Muhammad Ali, an inter-faith service in his hometown Louisville Kentucky and attended by the leaders of just about every religion. I read somewhere (and I think Lonnie Ali, his wife mentioned it too) that he had planned his funeral this way, just like he planned his mom’s. Quick recap from the BBC’s website about Ali. I don’t think I’ve watched a ‘richer’ memorial service, overflowing with stories about this one man who was and will always be the greatest. Everyone talked about how he had helped, inspired, rewritten the rules, stood for what he believed in, on and on, and on; his vanity and great sense of humor not excluded. It was really beautiful and makes me want to do so much more with my life. So much more. Then, this morning, just seen on Twitter that the Technical Director of the Nigeria Football Federation, Amodu Shuaibu, has passed on, aged 58. Apparently he complained of pain in his chest last night, and didn’t wake up this morning. My thoughts and prayers are with the families of the dead, and I pray God in His mercies provides the comfort and strength that only He can. We need to have an urgent national conversation about life expectancy in Nigeria, and healthcare services beyond the workshops, conferences, and stakeholder meetings that do not achieve anything tangible beyond per diem and pretty stationery. A bigger conversation we need to have within ourselves is the one about what we’re doing with our time here, and what we want to be remembered for. And also about life being short and therefore striving to make every single day count. I heard this quote last night; John Ramsey, family friend and former radio host said Muhammad Ali used to say, “Service to others is the rent you pay for your room here on earth.” He said Muhammad not only paid his in full, he’d paid it forward. What’s up with your rent? Learning… every window of opportunity (And my new crush)! Hope you had a good week… Mine was great. Could have been better, maybe I would have done some things differently, but I have no regrets. I went to Lagos for a meeting and got back into Abuja the next day, and as always I’m grateful for traveling mercies. Very grateful. Beyond sharing ideas and knowledge for a company I sit on the board of at the meeting, it was a time of great learning and reflection, and that’s what this post is about. Where do you learn? Are you one of those professional, it must be in a class/board room setting, with set objectives and goals type of people? And that’s fine, we’re all wired differently. Or, are you one of those ‘we see life lessons in the sun, moon and stars’ kind of people who pick tips and tricks from everything? I think I’m becoming more of the latter, while fully retaining the former part of me that does very well with formal learning situations. I have a friend, Adebola Williams, Co-Founder of Red Media Africa who makes me feel like I should have a Moleskine and a pen whenever I’m around him. It’s in the little things he does; the way he greets people, how he manages to make people (even strangers) feel noticed and special, the natural thought about optics and how things will be perceived or not, how he thinks so quickly about everything before it’s done, I could go on and on and on. I have another friend, Francesca, who believes there’s a lesson in everything, and therefore will never let me give in to dreary situations, who always looks for the silver lining even in pitch darkness, who has a positive outlook on life that will put motivational speakers to shame. And so from her I learn to put my melancholic bits under control. Errr, it’s just occurred to me that mentioning some and not mentioning others might start a fight (lol) so let’s generalize for the rest of this please. There are a number of them of who send me things to read because they know these pieces will be useful to me, who push me with questions like “what new thing have you learned today, what book have you read, what’s new with you (that has nothing to do with boys or fashion, lol), etc.” There are some who will tease me endlessly when I mispronounce a word, one who has tapped my head even (sigh), but who push me to continuously ‘upgrade’ my knowledge. Do you have those kinds of people? Don’t have to do exactly what my friends do (like hit my head) but I think everyone should have someone (or some people) who are ‘devoted’ to their improvement, and we should be that for others too. Only fair abi? Now, to my crush. Whoosh! I’m so in love! It’s the twinkle in their eye as they talk about rising from adversity and uncertainty to becoming (Francesca’s favorite word and I know she’s going to have my head on a platter for this, lol). It’s the calculated defiance, the refusal to be boxed in, hindered by limitations that were hitherto acceptable by everyone else. It’s their being able to stand in the face of grief and loss, and still be so awesome my heart is leaping within my chest just because I’m typing about them. My new crush is Dame Stephanie Shirley. She’s only got space for one ‘crusher’, my honorable self so please, move back! The Telegraph said of her “If there is a constant thread running through the life of Dame Stephanie Shirley it is the refusal to let difficulty and disaster stand in her way”. Such an inspiration! Big thank you to Tolu for sending the link to her TedTalk to me. I am a good person so I’m sharing it with you. I took out two things (actually I took out a lot of things but here are two I tweeted). And these below, are her keys to success. She says there are only two. I have now found a much longer video which I will watch as soon as I can get some free time from my nephew, which is an hour-long speech she made at Gresham College which traces her life growing up, coming to the United Kingdom via Kindertransport, her career and breaking several glass ceilings, her son and his autism, etc. It’s like her biography, only in the flesh. Excited, and I haven’t even watched it yet! I’m off now, have tons of work to get through this morning. Have a brilliant Saturday (and weekend), and never stop learning. I remember the first time I met Timehin – ok maybe I don’t really remember because I’m not sure if it was this year or last year – but it was after one of Glory Edozien’s events. Glory has a dialogue series where women come together to talk about issues from finance to beauty to self-esteem, was such a joy to attend that one on beauty. Anyway so a few of us chatted for a bit when it was over, Wana Udobang, Francesca Uriri, Glory, Timehin, and I, and we went from reflecting on life in secondary school, to the pressures of being a woman today (size, marriage, accomplishments, etc.) and it was so much fun! On the drive home (I remember we had such a laugh even though Fran kept ‘threatening me all over the place’) and Timehin said we were crazy. Good crazy of course (adjusts halo). I saw a tweet from her later, something about looking for friends in Lagos (took me a while to place it was the same person) and so I sent a DM and we’ve been ‘cool’ ever since! Timehin is a brilliant writer. Full stop. Even though I don’t agree with her stand on some things sometimes (which is alright because we’re not Siamese twins), the brilliance with which she expresses her thoughts is not up for discussion. She’s very frank in this entry, and I hope you enjoy it as much as I did. I don’t know if I’ve ever written one of these year-in-review things, or ever had any desire to. Time as we understand it, broken up into well-defined blocks, only gives me anxiety. The urge to compare myself to others, to look back at the vast expanses of ‘waste’ where I didn’t do things to advance me on whatever course I’ve chosen (or been thrust into), the desperate attempts to do better ‘next year’… Anxiety. 2015 was a strange year for me. I haven’t been an adult very long — I’m 24 — and 2012-14 were so full of almost back-to-back upheavals that the relative stability of this year felt unreal. I coasted into a new job and a new flat. My daughter started school. My boyfriend and I celebrated two years together. I employed live-in help. I was living like a ‘real’ adult, and the entire time I felt like an impostor in my own life; like I wasn’t doing enough, like I had been set so far back in previous years that I’d never ‘catch up’, like I was still a lost little girl hoping to be taken in hand by a kind person who knew the way. I worried all the time, and my mental and emotional health suffered. I spent a lot of days in a black hole, and on one of them, it occurred to me that I must figure out a way to take things one day at a time. Weeks of waking up crushed by the weight of something that felt too much like failure forced me to go easier on myself. I learned that I don’t have a handle on things, and that’s okay. I’m winging it, groping in the dark for what feels right, hoping for the best. I’m grateful for the chance to be somewhat kind to myself. I forget too often that nothing is permanent, and very little is as disastrous as I think it will be, and most importantly, that time does nothing but pass. I worry too much. I regret spending energy and time being afraid, instead of just taking the steps I knew I needed to take. I regret kicking myself when I was down, allowing other people’s misunderstanding of my inability to put one foot in front of the other to define me. I wish I had sat with my sadness more, instead of escaping it as quickly and for as long as I could. I apologise to myself. I didn’t happen on any big answers this year. I eased into discoveries; that I have depression, that I’m actually quite funny, that no one will look after me better than me, that I am responsible for defining the boundaries of my life. I learned to let my daughter climb in bed with me and talk about all sorts first thing in the morning, even when I’m working, because she won’t be three forever. I learned I deserve to be looked at with awe and love; that the person in her eyes is indeed me, and I am as wonderful as she thinks me. I learned that it is okay to ask to be loved the way I know I need to, and it is okay to refuse anything less. In this moment, I am closer to my centre than ever before, and the feeling that I am getting to know my own self, and to love her wholly, is more wonderful than anything else. It is wonderful enough that I am perfectly content to give the process as much time as it needs. My name is Timehin, I’m a Nigerian living in Lagos, and I’m a writer. Gorgeous girl! Of course you’re a writer! Here’s to greater progress on your journey in 2016, and happier, less unpleasant days! Mwah! Tessa’s on today, and her post is one that invokes memories for me, and I’m sure for everyone else who has ever lost someone. Her voice is one of thanksgiving though, and it is a charge to us that even on the days when we just want to curl up in a ball and moan, we can (and should be) thankful. Harder than it sounds I know, but doable. I am writing the 30 days of gratitude challenge and even though I don’t feel perfect inside me, I realise that I don’t have to feel perfect to give thanks. Why don’t I feel perfect? I am still getting used to the fact that my dad is gone. My daddy died on the 1st of October in the early hours of the morning. I didn’t think I would cry but I did and I grieve but in spite of that I’m grateful for his life and that he got his chance to make his peace with God. Life without God is not a walk in the park. I’m writing on my way to church. I’m thankful to God that he got a glimpse of God even if he didn’t get to walk closely with God. I am thankful for my family. For love, for life, for God’s grace and favour. I’m thankful for the victories that we have gotten and more to come. I’m thankful of all things for the relationship I have with God, even though I’ve not been talking much to Him, just listening. I’ve not gotten my bearings yet. In spite of my silence, God is still good, I keep seeing His hand around me, even in things I didn’t pray about. I am kind of low on compassion these days cause I am looking out for yours truly. I am thankful for the new year and this one. It would be interesting to see how we cope without our dad and who he was to us. I am confident though that God is not going anywhere, he remains in the midst of us, lifting, guiding, protecting, defending and leading us and most of all, I am confident he has good thoughts for us. Nothing prepared me for this but I believe it’s the right time. It happened at the time that God allowed. I’m stretched on all sides trying to be everything for my family members and failing. Now, from this moment, I surrender it all to God, He is the One who knows how to take care of us all, all the aspects of our lives, and most especially, our inner man, He knows how to soothe the hurts, how to work through the pain, pierce between soul and Spirit and bring peace and calm, he knows how to sort between friend and foe and bring helpers, Jonathan’s, sent by God. He knows how to take off the pressure and lead beside the still waters, so even though I weep, I’m grateful for new things. I trust God to make a way in the wilderness and bring streams in the deserts. So in all the awesome things that have happened and in the passing of our father, the One God gave, I give thanks. O Give thanks to the Lord, his mercies endureth forever. First off, my most profound condolences on your dad…it is well with you. Receive strength and comfort from The One who gives and gives and gives. Plenty hugs, your family’s in my thoughts and prayers. Second, I envy your relationship with God, seriously I do! And I trust Him for grace for myself to be able to lean on Him completely. Hey aunty… what’s happening in heaven? In the last five days or so, there has been one reference to my aunt or the other. And each time I’ve smiled. Not because I don’t miss her (and I miss her terribly), but because… I don’t know. I think of all the times she said things like, “it will get better, this thing you don’t seem to have now, no be this life? You go get am tire.” If only she knew how true her words were! I stumbled on one of the songs that helped me get through her passing this morning, and I played back the 22nd of July 2013 real quick… how from a phone call about 5am my life literally became a blur for months on end. How I refused to go to church for a while after she passed, and then getting super angry the day I finally went because the pastor started preaching about how God could heal everything, including cancer. I remember I was like, “yeah, and you had to preach this after it killed my aunt abi?” And of course that meant I didn’t go for a bit after that. I remember when we checked to see if my nephew would remember her (he was like a year old when she passed), and of course he didn’t (I wonder what we were thinking). I felt a little upset he didn’t remember the person who was literally his nanny when we all went to work, who was there from the first day of the pregnancy, encouraging my sister, spoiling her (because of her own struggles with pregnancy pregnant women could do no wrong in her eyes, lol), how she spoiled my nephew with gifts, and how he loved playing with her, and then falling asleep on her big body. I think that was all the children around then, who didn’t want to sleep on Big Mummy’s body? I miss her o, kai. I remember attending Winners’ Chapel Durunmi, and us queuing for puff puff every Sunday after service. It was like an unspoken ritual. Even if we were all angry with each other, we would still buy and so would start talking to each other from eating the puff puff in the car. 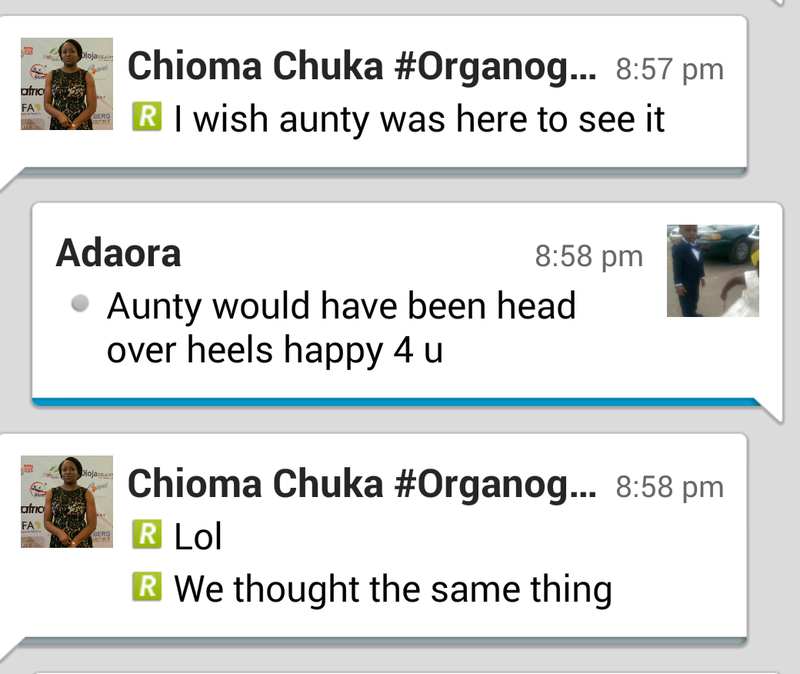 Aunty was a unifier; like she couldn’t stand for malice, quarrels and all of those kind of things. I remember quarrelling with an ex once and he called her to report me (the gall of that man). She invited him to the house and we were sat in her office. She was trying to ‘settle the fight’ but I guess we were arguing too much. Know what she did? She got up, left the office, and locked us both inside. Said she wouldn’t open the door till we had sorted out whatever was making us argue like we were strangers. Lol!! I nearly popped an artery from anger! But she didn’t open the door! We eventually settled down, had a conversation, and then she opened the door. I love her. I really do. Years ago someone stole my parents’ numbers from my phone and sent them lies about me. My parents (resident outside Nigeria at the time) rang her and she stood up for me. Not only did she do that, she went to the person I had wronged according to the lies, had a conversation with her (that one had only sweet things to say about me), and got the woman to call my folks to tell them not to be bothered about whatever message they had received because it was a lie. I didn’t know she’d done this till my folks called to say, “this is what your aunty Pat did”. God bless her, I have stories for days! Interestingly, she ended up telling me which of my friends had done the texting, and about a year or so later, we were right. She’d been cautioning me about a friend who she said had envy in her eyes and would rubbish me if she could; one who would come spend nights with me but would say things like, “na wa, how can only you have this or that?” I never took it seriously, till an incident involving a job a few years later. I’m sure I heard the Yoruba proverb, “the insect that kills the vegetable lives on it” at least a million times when she was alive. The memory of the righteous is blessed. You’re blessed aunty. I love you and miss you everyday. How have you been? Good? How’s work, your family, your life? Greetings from Leamington Spa, green, quiet, quaint, serene, providing such a connection to my spirit. Nope, I’m not going to apologise for not being here for a bit. I needed the time away. The past few weeks have been difficult, and I decided that instead of masking the things I was going through with activities (like climbing trees, lol… that story will be told soon), I wanted to drop everything, go away, think, cry, pray, workout, jump (happening soon); everything to bring myself back to myself, if you know what I mean. In a few days it’d be another anniversary of my aunt’s death. My darling aunt, who we still talk about everyday, who I still feel very close to. Puts to shame all the ‘time heals all wounds’ talk people say, except two years isn’t classed as time. I miss her. Yesterday, today, everyday. Some days are hard, some others are harder, some days are a damn blur. Keep resting aunty. I love you so much. So damn much! So I woke up about 4am this morning, couldn’t sleep anymore. Maybe cos I left the curtains open and summer means the sun rises about 3.50am, maybe my eyes were tired of sleep (like my aunt would say, lol), dunno. I just couldn’t sleep. Anyway, so I started catching up on emails, articles, all those kinds of things, and then I remembered two songs I heard in like 1995, maybe I even danced to one of them in a group, don’t really remember. And so far I’ve played both of them back to back like 10 times each, and they’re so uplifting I thought I’d share with anyone going through a rough time/patch. This is from an era when music was truly uplifting, not the rubbish we have to endure now. Sigh. This is ‘Count it all joy’ by The Winans. And then there’s this one by Sound of Blackness called ‘Hold On’. Fun, really great song. Check on it! I’m talking to myself as I say this. You will feel better. That pain will pass. You will want to get up and work again. Your morning will come. That heaviness will lift, hard times will pass. Just keep holding on, keep working at it, hanging in there, keep looking up, to the One who has our manuals and the perfect story of our lives. Today’s a great day, whether you like it or not! God’s got you! PS 1 – God bless Ruona for me today. Not tomorrow. Today. I miss her everyday – the memory of her in my heart is living, breathing, possessing a full life of its own. There is so much to catch up on, stories to exchange, gossip to whisper (and laugh about), shopping and travel to get through, foods to cook (her fried rice is legendary and till date the only way I know to make it) – there’s so much she’s missing out on because she’s not here! I miss her. Kai. I miss her in ways I cannot explain. I was in church on Sunday (House on the Rock The Refuge) and in the midst of dancing my heart out in appreciation to God, I teared up with a speed I didn’t think was possible. Why? The choir sang a song my aunty used to sing, even in the height of her pain. Gorgeous woman. Funny, I was chatting with my sister earlier this evening, telling her of something else God sorted for me today. Guess what, our comments were the same! Different wording, but the same thought: we would have wanted to share this with her, and we just knew what would happen when we did! Aunty, quick message to say I love you loads. And I miss you everyday. Keep resting, I can imagine you and Aunty NK are causing quite the ruckus up there, keeping God and the angels entertained. Give them kisses from us here ok? I’m horrible with writing about death, but then I guess everyone is, and at some point or the other in life, we will have to do things we’d much rather we didn’t. Even the death of an enemy leaves a sour taste, talk less of a friend, family member, or in this case, someone I really admired and would have been super privileged to meet. I watched a TedTalk at the end of 2013 Mr. Dumor gave on reporting stories out of Africa, and he should know, he’s been the face of BBC’s Focus on Africa from the inception of the programme in 2012. Everyday. His talk was so funny! Beyond the laughs, I was totally smitten by his confidence, his eyes, alive with excitement and maybe mischief and I was upset when it ended. I told myself that I would meet him in the New Year, and even though I didn’t immediately have a plan to do that, I purposed to try. On the evening of the 17th, I was chatting with a much older friend of mine, and Komla came on. I mentioned I was a massive fan and I wanted to meet him, and this friend said they’d been in the same class at Harvard and sure, he’d facilitate an introduction the next morning. I was super excited, and the only thing that stopped me from insisting on an introduction there and then was the fact that it was a little late, and I was literally on my way home. And then about midday the next day, I saw on Twitter that Komla Dumor had passed. What??? “Cruel jokers”, I thought, racing to BBC’s website to prove they were wrong. BBC didn’t carry it immediately, but staff were already tweeting condolence messages. Just like that, he was gone. Aged 41, Komla Dumor passed of a suspected heart attack. One day on TV, gone the next day. The uncertainty that this life is. I grieved like I had lost a personal friend – because it was yet another reminder that life is short, and we must do whatever we need to do as soon as we can. Grieved all the way to Instagram. And so today, exactly six months after, somehow I can now write and bid him farewell, hope he’s in a better place, and tell him he was a shining light for us young uns. More importantly, I pray for God’s great comfort on his family. Rest in peace Komla Dumor. Happy birthday to my darling aunty Pat! Happy Valentine’s Day everyone! What are you up to today? What love-related activity are you going to partake in ‘in the name of love’? Huh? What did you say? Ok, whatever you do, let it be stuff you can defend before God o! I’m also going to Jesus House tonight with my girl Toks, looking forward to that! Apparently this branch of the Redeemed Christian Church of God have a 24 hour praise event going on and what better way to spend the evening than in my Father’s House? Plus I haven’t been to Jesus House since Christmas of 2010, so it’d be nice to fellowship there again. Yeah, so we’re going to go. I’m also going to have lunch at Jamie’s Italian too, fingers crossed I can get the exact table we got this day, last year. See, it is/was my awesome aunty Pat’s birthday, and it was just the both of us in the house so she asked me to suggest someplace we could go. We had a proper party planned over the weekend (caterer and everything) but she just felt like both of us should do something together. And since we were up to our eyeballs in Chinese, I suggested Italian. And so off to Bluewater we went. I will never forget it. We ordered our starters, and when the mains came, she said, “is this it”? Lol! We ate, I was stuffed, she was not, so we ordered desserts. Our bill came to just under £80 and when she paid, she said, “we should have used this money to buy perfume or clothes, stayed in the house and eaten our food jor! I’m still hungry!” Bless her. We laughed, and went home. I’d given her the new DKNY perfume (aunty LOVED perfumes) – I don’t remember the name but it was the green of the 2013 apple series they did – she loved it! Thing is, aunty loved whatever she was given. Even if it was beneath her (and she’d never make you feel that way), she would accept it with thanks and one of her very big smiles! Later that night she begged me to make semovita for her. After she ate, she said, “yes, now person know say im don chop! !” We both dozed off soon after. Aunty. It’s already been 7 months since you went on to glory, and 8 months since the last time I saw you. I miss you so much, and I love you forever. Have nothing in your house(boat) that you do not know to be useful or believe to be beautiful – William Morris.